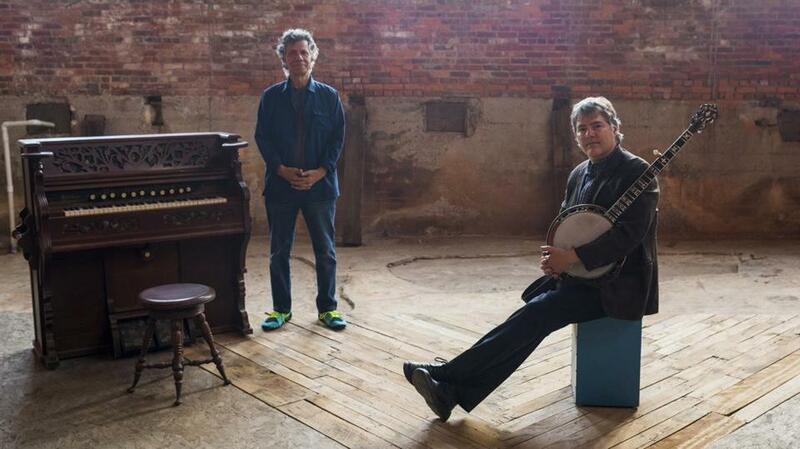 Chick Corea (left) and Béla Fleck performed at the Wilbur Theatre on Sunday. Bill Monroe’s “Jerusalem Ridge” is a bluegrass classic, soaked in the Irish and Scottish sounds Monroe remembered hearing the old folks play when he was a boy in rural Kentucky. When keyboard jazz great Chick Corea and banjo maestro Béla Fleck played this song in their duo show Sunday night at the Wilbur Theatre, there were moments when it was almost hard to distinguish one instrument from the other. In Fleck’s “Waltse for Abby,” cascades of notes flowed together as Fleck played fast runs up the neck of his banjo while Corea nimbly essayed lithe statements with his right hand, occasionally punctuating them with bluesy phrases. For Corea’s “Children’s Song #6,” the two alternated lead and rhythm roles, seemingly dancing in and out of each other’s musical footsteps. Corea and Fleck are each master collaborators. Fleck’s life project seems to be to demonstrate his instrument’s relevance within every imaginable style, whether playing with African musicians or winning the Grammy Award for best classical crossover album, as he did for a 2001 record with bassist Edgar Meyer. A first-generation fusion pioneer with a deep interest in composition, Corea — who warmly acknowledged his Chelsea roots several times on Sunday — is also a duo specialist, alternately teaming with Herbie Hancock, Stanley Clarke, and vibraphonist Gary Burton, the latter a longtime presence at Berklee College of Music. Bluegrass and bop-derived jazz forms may be related in terms of basic song structure, but they remain estranged cousins, with few satisfying syntheses. Corea and Fleck did not provide this particular missing link. Instead, they seemed most comfortable meeting on classical-informed terrain; the show had the feeling of a concert recital. Corea’s rhythm chops on Fleck’s “Mountain” seemed less vital than the delicious little banjo runs, suggestive of a harpsichord, in the Scarlatti pieces. There was plenty of fast-fingered virtuosity on display, but this seemed almost beside the point. The best pleasures here came not from individual exploits, but the interplay of two voices.